This story is the final part in a four-part series about our Halfsy Hero, Carl Samuelson. 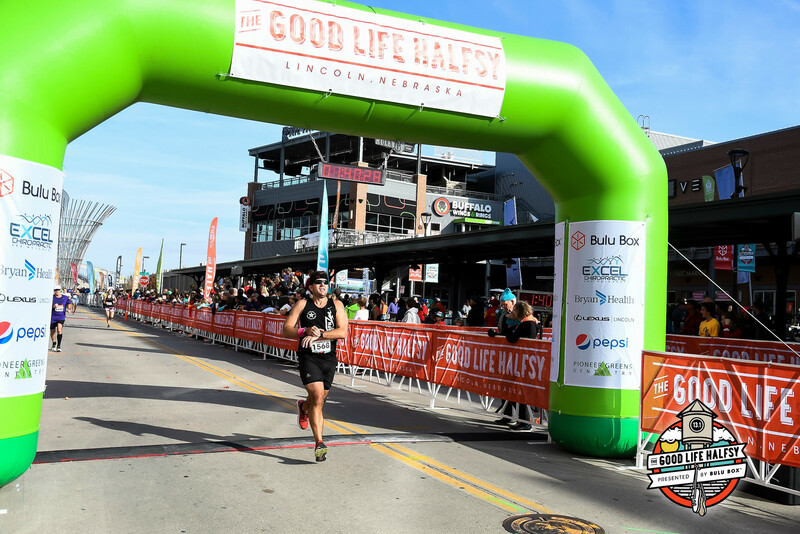 Our series followed Carl and three other heroes as they trained for the November 6th Good Life Halfsy. Carl has his pre-race routine down. He gets there early, checks his gear, warms up and then mingles with his fellow racers before the race starts. Despite his injuries and a slower-than-usual training cycle, Carl said he was excited to start the Halfsy. He’s run this race ever since it started, and has enjoyed seeing the race change over the years as his own running and competitive spirit has grown. Overall, Carl said the race went well for him. He got in a groove and made it to the 11-mile marker before his pace started to waver. He slowed down a bit, but not for long. Carl said the pacer for the 1:40 time was a friend of his and she encouraged him during the last few miles to pick up his pace and finish well. Carl finished ahead of the 1:40 pacer and was very thankful for her encouragement toward the end of the race. And while Carl said the weather was much warmer than he would have liked for a November race, it was the perfect temperature for the post-race party. For Carl, the social aspect of running has been as big of a draw for him as the physical benefits. He loves to run and train with friends and so the post-race party is always a highlight, he said. Carl was able to grab all kinds of stickers and race swag to send in the mail to Faith, and refueled with snacks and fun conversations with other racers. It’s races like the Halfsy that get Carl thinking about why he started running in the first place. What started out as a way to get fit and change his lifestyle from a couch dad to an active dad has shifted so many other areas of his life. Carl said he’s thankful he can continue to run races, compete well and look forward to more races in the future. He’s got his eyes set on qualifying for the Boston Marathon in 2018. By then, he’ll be 40, allowing him to compete in a different age-range and giving him added motivation for training and competing. But that’s a long ways off, Carl said. Right now, he’s focused on running local races, staying in shape by running with friends and continuing to run for his health, his family and Faith. Read all of the Halfsy Hero stories, or go back and read the four installments of Carl’s story.